Take it Outside: Summer Picnicking Tips & Tricks | Mealtime | Kids VT - small people, big ideas! Nothing completes a summer meal like a fat slice of the great outdoors. Whether you're eating fried chicken and potato salad, grilled portobelli, or a loaf of bread and a jar of peanut butter, family dining is just better al fresco. "You say to the kids, 'picnic,' and they know it's going to be fun," said Terra Heilenbach, a Jericho mom who grew up celebrating her birthday every year with a barbecue in the park. I found Heilenbach at Burlington's Oakledge Park on a sun-kissed Saturday in June, sharing an impromptu cookout with family and friends. Her 3-week-old son, Illo, slept snuggled in a sling against her chest while she explained that this was already his second picnic. A week earlier, Heilenbach had taken him and big brother, 2-year-old Finch, to Mills Riverside Park in Jericho. She likes to pack finger foods, along with extra water to rinse those grapes that hit the ground. "For kids, I think just getting out of the house changes their vibe," Heilenbach said. "The space entertains them." At Mills Riverside, she said, Finch played with toys and waded, and baby Illo slept in the shade of the cooler. While we talked at Oakledge, Finch ran by, chasing his father's business partner with a stick. "What are you doing, Finch?" Heilenbach asked. I met more picnickers at Burlington's North Beach, including Tasha Beaupre, mother of four. She counts kids burning energy as a picnic plus. I talked with Beaupre as she dined with a gaggle of relatives. Watermelon, strawberries, hot dogs, chips and water are this Burlington family's picnic staples, but what's on the menu doesn't really matter to 8-year-old Phoebe Beaupre. She's all about the sand and the water, said her mom, Terrie. "Really, what we do is just put food aside, and she'll eat when we get home." Nearby, 3-year-old Amelie Grujic filled a floppy, pink sun hat with sand and presented it to her mother. "It's ice cream," she said in her native German, with her dad, Zlatko Grujic, translating to English. The Grujic family was visiting from Germany. Amelie and sister, Lana, who's 5, love to eat sausages on their picnics. "You can also make great bananas on the grill," offered their mom, Sabrina. She offered some unique ways to grill fruit: Cut a banana lengthwise, stuff chocolate chips into the slit, wrap it in foil, and grill it for seven or eight minutes. Or core an apple, fill it with chewy caramels, wrap and grill until it's as soft as you like, probably 15 to 20 minutes. 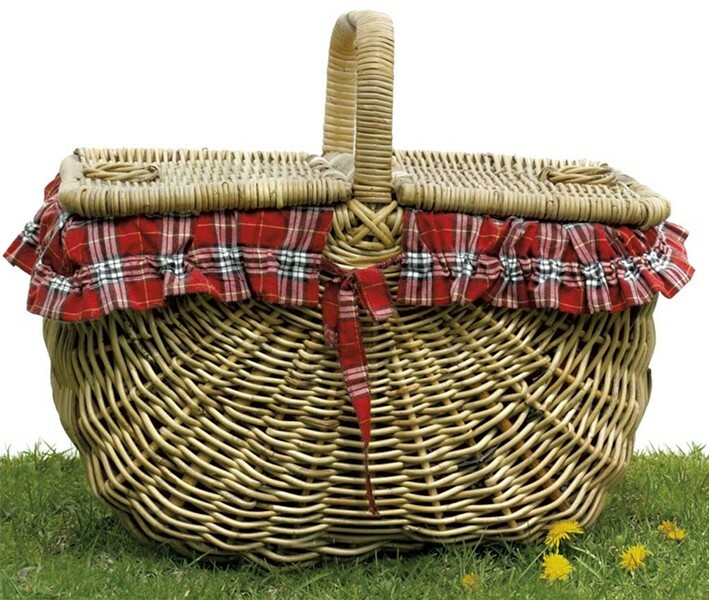 Down the beach, two local families relaxed around a wicker picnic basket lined with red, plaid fabric. "Pack the night before, or at least prepare everything the night before," advised Rose Wood, who lives nearby in Burlington. Still, added her friend Kristen Badger, expect to leave an hour late; wrangling kids and all of the stuff you need takes time. The effort pays off, though, thinks Badger's 12-year-old nephew, Matthew Dow. "Lake Champlain and s'mores," he said. "Perfect combination." Bring finger foods, such as chicken wings or drumsticks, open-faced sandwiches, boiled or deviled eggs, corn on the cob, sugar-snap peas and watermelon. Keep it simple. Instead of drinks in pitchers, let kids use their water bottles. Instead of salad, pack cut veggies. For a quick dipping sauce, mix - cup each freshly ground peanut butter, tamari and water (adjust the water for desired consistency), 4 teaspoons toasted sesame oil, and 2 to 4 tablespoons of maple syrup. Shake till smooth. Leftovers are great on noodles the next day. Go for wholesome. "Show your kids that outdoor exercise and fun goes along with good nutrition," Homan said. Skip processed, packaged foods and sodas. If you must have chips, try organic corn versions, which pack some whole grain and fiber. Come prepared for cleanup. Bring a wet and dry cloth to wipe hands and faces, trash bags for disposables and containers for leftovers. Conceal dessert until the main dishes have been eaten. Nothing saps a kid's incentive to reach for a carrot like a plate of brownies. If your picnic site sells treats, don't bring dessert at all. That way you can say yes to the creemee stand. Find more information about Homan's class at citymarket.coop.